See the general QC user guide. 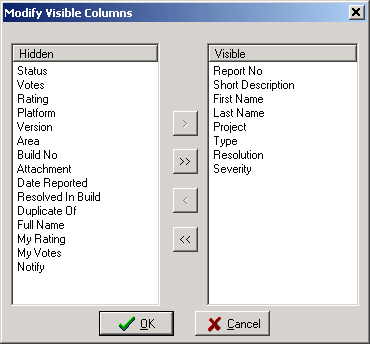 The Windows GUI client has two main modes of operation -- working with a dataset (either creating or viewing), and query mode. By default, the client starts in "dataset" mode. Keyword searching is not yet implemented. It will allow you to put in discrete words for the short and long descriptions, and work arounds. The report list is a data grid that can show most of the fixed-length columns in the dataset. It defaults to showing the report number and the short description. You can display the report list by clicking the grid icon on the main form, or selecting the "View|Report List" menu. You can change the display order of the data in the grid dynamically by clicking on the column heading. If you want to toggle between from ascending and descending order for a specific column, simply click on it again. For example, click on the Last Name column a few times and see the way display order is instantly changed. You can also sort on multiple columns by holding down the shift key and clicking on a column to add to the sort list. If you Shift+Click on it again, you will reverse the display order for that column only. If you Shift+Click on the column again, you remove it from the sort order. Clicking without a shift will make the column you click on the only column in the sort order. Note the small numbers inside the arrows. The arrows indicate the direction of the sort for that column, and the number indicates that columns position in the sort order. Rate every report you possibly can. It doesn't take long to rate a specific report. The more accurate you can get with your ratings, the better the data in QC becomes. This raises the effectiveness of Borland's processing of the report in QC. See the article Calculating the community point spread. Voting differs from rating by forcing you to be more selective. You are limited to 5 votes per project. You can use all 5 votes on one report, or vote on different reports for that project. Votes are given a much higher importance than a rating, because you have to be selective with your votes. Anyone can rate any report. Ratings reveal the general feeling of the community as to the quality and clarity of an entry. Voting is used to cause the good reports to really bubble to the top. Votes will prioritize the high quality reports. They will tell Borland which reports are important to the community. Think of 100 reports. 25 are rated 1 and 2, 25 rated 3, and 50 are rated 4 and 5. That means that there are 50 really good reports of real value in the database. Which ones are really important, however? The votes will cause those good reports to be ranked. As I mentioned previously, you can use all your votes for a project on one report if you so choose. It seems this guide needs some attention, as much of the content is missing.